A trek to EBC never fails to disappoint. Sure the critics will grumble about too many people and the exploitation of locals and the trek being covered in rubbish but you can be sure that it is these very same folk who have never been here themselves and that they would be very pleasantly surprised if they did.The trek to the base camp of the world’s mightiest mountain starts with a flight straight from the pages of Biggles… It bounces over airy passes and lands on a postage size airstrip to emerge in the Sherpa village of Lukla. Being transported from the bad craziness of Kathmandu to this tranquil mountain landscape is like experiencing a time warp.After a huge calorie packing breakfast we set of direction Mount Everest slowly emerging ourselves into the Sherpa way of living for the moment and quietly experiencing the un-expected pleasures of this magical valley as they unfold before us; We follow this ancient trade route through traditional mountain villages, lush farm-land and colourful Rhododendron forest, gradually climbing higher to meet Yak teams festooned in Bells and red tassels. We are continuously stepping aside to let sturdy Sherpa carrying enormous loads pass us on the trail that at times seems literally to be hanging above yawning canyons. Whilst, of course getting up close and very personal are the mightiest mountains on the planet; Dominating our imagination at first are the impressive 6000 meter peaks featuring strange names like Kussum Kanguru and Thamserku then these begin to be dwarfed by mightier peaks such as Ama Dablam and Kantega before finally the mightiest of them all, Everest, Lhotse and Nuptse glistening with glaciers and throwing avalanches left right and centre begin to hold your attention for seemingly a very long time. 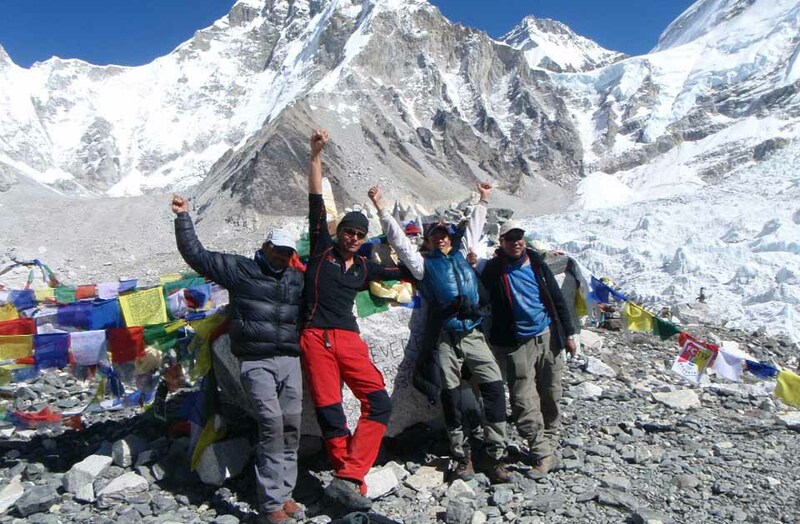 Of course the outstanding trekking, submersion into the Sherpa culture and basking in the jaw-dropping splendour of the surrounding peaks is one thing and enough to leave a smile on your face for quite some time but to add that little extra to this lifetime trek you need to physically throw yourself at the more little known opportunities and experiences that await those who dare.Like Biggles would ascertain if you don’t try you won’t fly (even higher!). Climb to the hidden Monastery above Phadink and play football with the young Monks that live there. 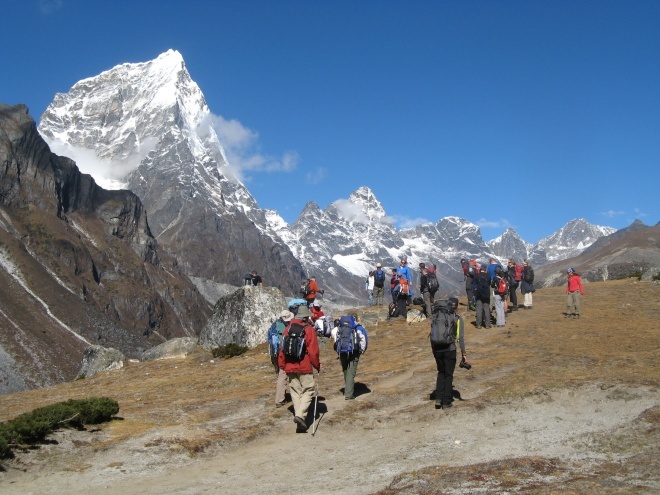 Climb the 5100 meter summit above Dingboche on your scheduled rest day and stand in awe as un-beatable views of the Mighty Ama-Dablam and a distant Makalu the 5th highest mountain in the world stretch out before you. Pop into the house of a famous Sherpa ice-fall doctor and 6 times Everest summiteer to drink copious amounts of Chang, progressively getting more fluent in Sherpa language as you do so. Climb onto the rim of the Khumbu moraine and watch the sun-set over this vast glacier and listen to it moan and grumble , Enter the Khumbu ice-fall just below base-camp and get lost amongst huge glistening ice towers and best of all climb Khala Pattar for the sunset (or sun-rise) over the greatest show on Earth. Go on, let 2015 be the year that you throw yourself at this mighty experience!! Don’t hold back let 2015 be the year you remember with the widest smile of all!